SA vs SL, or AB vs Kumar? Sydney - JP Duminy took a hat-trick as South Africa's bowlers left their side on the brink of the Cricket World Cup semi-finals after dismissing Sri Lanka for just 133 at the Sydney Cricket Ground on Wednesday. The Proteas have never won a knockout match at the World Cup but a failure to do so now would count as their greatest 'choke' of all. After South Africa's pacemen reduced Sri Lanka, who won the toss, to four for two, leg-spinner Imran Tahir (four for 26 in 8.2 overs) and off-spinner Duminy (three for 29 in seven) made sure the innings never got out of first gear. Sri Lanka great Kumar Sangakkara, in what could be his last one-day international appearance before retirement, top-scored with 45 as his record-breaking run of four successive ODI hundreds came to an end. Together with Lahiru Thirimanne (41) he put on 65 for the third wicket. But otherwise there was little batting resistance on a good SCG pitch, with Sri Lanka - the 1996 champions and beaten finalists at the last two World Cups -- losing four wickets for two runs in nine balls as they slumped to 116 for eight. Kusal Perera, promoted to open the innings, fell for three when he edged Kyle Abbott and was brilliantly caught left-handed, at the second attempt by Quinton de Kock as the wicket-keeper dived in front of first slip. The Proteas struck again when Tillakaratne Dilshan was out for a seven-ball duck, edged a rising delivery from fast bowler Dale Steyn to Faf du Plessis at second slip. Thirimanne, who struck five fours, exited when he chipped an easy return catch to Tahir. The Pakistan-born spinner then dismissed Mahela Jayawardene for just four when the right-hander -- in what could be his final appearance for Sri Lanka before retirement -- gave a simple catch to short mid-wicket. Sri Lanka were now 81 for four in the 24th over. There was no recovery, with Duminy dismissing Sri Lanka captain Angelo Mathews and then, at the start of his next over, recording the ninth World Cup hat-trick. 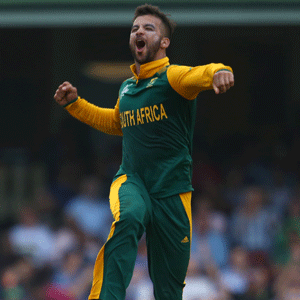 In the midst of Duminy's treble, Tahir dismissed Thisara Perera as Sri Lanka's collapse continued. Just before rain stopped play, Sangakkara was caught at deep third man off fast bowler Morne Morkel for 45 off 96 balls including just three fours. Play was only halted for a matter of minutes and soon afterwards Tahir dismissed Lasith Mainga to complete a superb fielding performance by South Africa which left them on course to face either New Zealand or the West Indies, who meet on Saturday, in a March 24 semi-final in Auckland.